There are now more ways than ever to sell online. You have to decide whether you should use WordPress + Woocommerce, Volusion, Shopify, BigCommerce, or any of the others. To get the most out of whichever platform you choose, you shouldn’t think in terms of “which is the best”. Instead, think about “which one is best for my business”. You want to choose a platform that’s right for you. How easy (or expensive) will it be to customize? What’s involved in migrating to or away from the platform? Shopify is an ecommerce platform that lets your start selling online on day one. If you want to get your online store up and running fast, Shopify might be right for you. Here are their current plans and pricing. Shopify aims to be a complete online shopping solution. They handle the web hosting and provide the infrastructure to run your store. That means you won’t need a separate hosting account or WordPress site to get your store running. Even with their Basic Shopify plan at $29 a month, you can create an online store, add your products, accept credit cards, track sales, email your customers, and a lot more. Basically, this is everything you’ll need to start selling online. There are plenty of testimonials around where Shopify users talk about how well their online store is working out. That kind of social proof is great but it doesn’t really help you make a decision. Using the list of important considerations for any ecommerce platform from above as a framework, we can see if Shopify is a good fit for your business. How will your store design look? Is help available when you need it? You already saw the pricing table above. Shopify’s plans start at $29 a month with the Shopify Basic plan. This plan sets you up with a complete online store, basic customer management tools, access to all the free themes and the Shopify App Store. You see more about Shopify themes and Apps down below. The only additional cost you need to think about outside of Shopify is registering your store’s domain name. If you take advantage of the sales that many registrars like 1and1.com, Namecheap, and GoDaddy offer, your first year of registration could cost as little as $0.99. At the most you’ll pay $14.99 annually. When you compare this cost with the expense of setting up your own web hosting account, Shopify is only slightly more expensive. Set up web hosting with a company like Webhostinghub.com (who I highly recommend). By and configure an SSL certificate to secure your customer’s credit card information. Get a payment gateway with a company like Stripe or PayPal so you can accept credit cards. Install and set up WordPress and Woocommerce. Set up regular backups and make a plan to update your site routinely. Professionals performing these services (like me) will charge you for this. Pick a theme. There are lots of free ones. I can recommend OceanWP as a great place to start. If you do this all yourself and aren’t a web professional, this could cost you hundreds of dollars and take as many hours. Sign up for Shopify. Pay $29 a month to get started. Pick a theme for your store. There are many beautiful free options. The paid options are even nicer. Add any third party apps that you need. Some of them are free. Others have a monthly subscription. The prices range depending on what they do. That’s just about it. And it’s just the beginning. The more expansive accounts offer even more extensive features to manage customers and sales. With Shopify there’s no need to worry about securing credit card data. They take care of it. There’s no need to schedule backups or software updates. They take care of it. Starting off with Shopify does add a recurring bill every month. That’s definitely something to be aware of. In my opinion, it’s not much compared to the money and time you’d spend on hosting, securing, and building your own site. Instead you can spend your valuable time working on your business, not in it. A note about the Shopify Lite plan (that’s not included in the pricing table above). This is an extremely limited plan. It allows you to get things going by using Shopify’s “Buy Now” buttons. You can set up your products and use the Buy Now buttons to sell your products on your existing website or on Facebook, Tumblr, or basically anywhere you want. This plan can let you ease into selling online without much overhead or setup time. According to Shopify, every store on any plan uses SSL certificates and are PCI compliant right out of the box. That’s great! But what the heck does it mean? Let’s unpack it a little. PCI stands for Payment Card Industry. This is an organization put together by major credit card companies. Part of the PCI organization is the PCI SSC or Security Standards Council. They’ve made themselves responsible for creating the standards for credit account and transaction security. 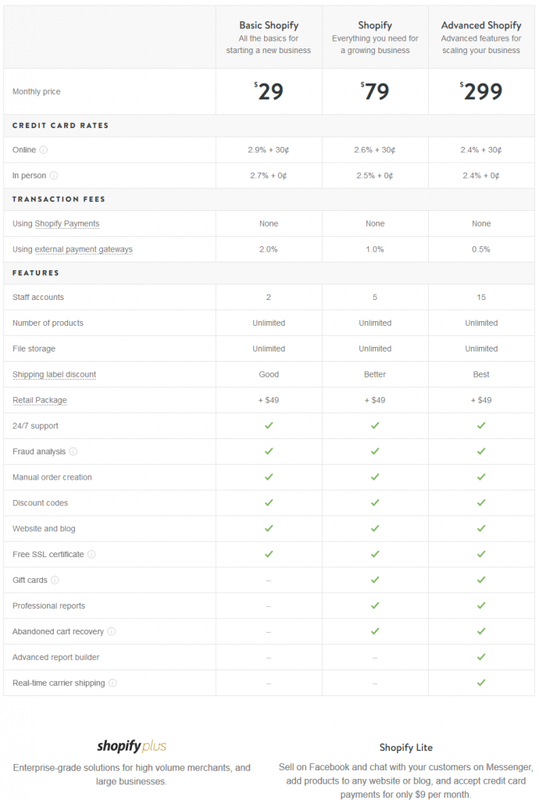 When Shopify says that it’s 100% PCI compliant, it’s the standards from the PCI SSC to which it’s referring. SSL means Security Socket Layer. This is a layer of encryption that helps protect credit card information from anyone not part of an online transaction. In addition to adhering to these industry standards, Shopify has instituted the Whitehat hacking program. This program is listed with hackerone and offers bounties to security researchers when they discover exploits in the Shopify system. This proactive security approach helps to discover weaknesses so they can be fixed before the bad guys find them. Design should never be an afterthought. It’s true that sometimes an ugly website will convert as well as or better than an attractive one. It’s also true that in those cases, the root reason one website converts better than another has to do with elements other than design such as superior copy, better organized page structure, well placed calls to action, and understandable navigation. All those things being equal, design does matter. No worries with Shopify on this front though. They have a well stocked collection of website themes. There are many attractive ones available for free. If the collection Shopify offers isn’t enough for you, there are plenty of others available over at Themeforest. When you go with Shopify, you never need to be ashamed of giving out your website url to friends. There’s no excuse for having an ugly website. Does Shopify have the features you need? 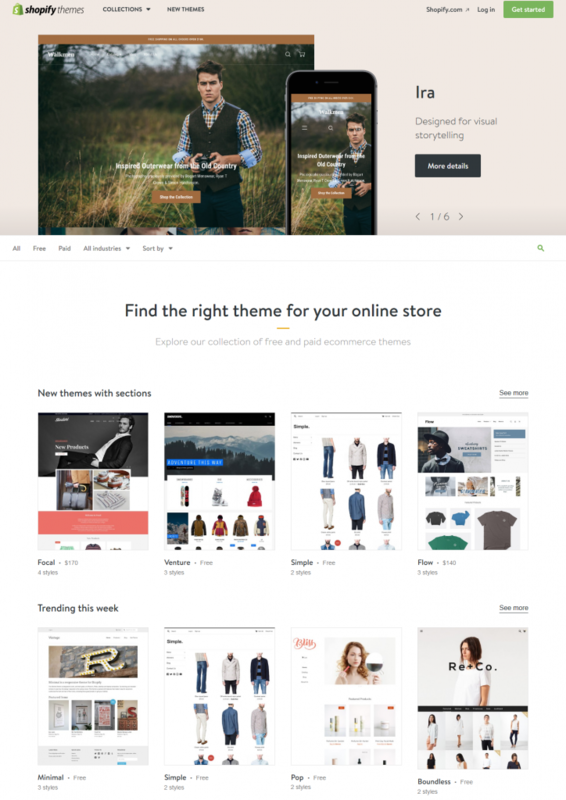 We’ve already seen Shopify’s security measures and large collection of free and inexpensive themes. Beyond those, when you think about what features you need from an ecommerce platform, you want to think about what you need to manage your products, customers, track your sales, and generate reports. Add products, upload an unlimited number of images, and include product details like size, weight, color, manufacturer, and other details. Manage your inventory levels and bulk import products from Magento, eBay, Excel, and csv. Sort your products into collections based on categories or attributes like price. Create any web pages you need like an About or Team page. Build and maintain a blog or import the blog from your WordPress site. Customize order emails using Shopify’s email templating system. View information about your customers. Shopify Payments is their in-house payment processor. Accept credit cards for as little as 2.4% + 0¢ on each transactions. You can also accept payments from the most popular gateways including PayPal, Stripe, Authorize.net, and Amazon Payments. Customize your products or extend the functionality of your store. Shopify has an extensive store full of premium and free apps. Shopify brings all the core features and provides the venue for developers to build specialized apps that plugin seamlessly to the rest of Shopify. Integrate your store with QuickBooks, MailChimp, or one of dozens of other third party services. Add new functionality like order tracking with Aftership, or let your customers log in using their Facebook account with Open SignIn. What’s Involved in Migrating to Shopify? There’s not a standard way to store data about products, orders, and customers. Almost certainly, no two platforms will organize their databases the same way. You’ll probably want some sort of intermediary app or service to translate. Platform migrations can often be troublesome even for small stores. Luckily, there are a few apps available that can make it easier. Woocommerce – Import your products from your WordPress + Woocommerce site. Excelify – Move your products and customers from Magento or other shopping carts to Shopify. Cart2Cart – If there aren’t any apps specific for your migration, Cart2Cart may be right for you. If you have a large online store, migrating to another platform can be complicated. Some of the apps above may help but you might consider using a service to take the pain away. Putting together an online store can be challenging. If you’re looking for an all-in-one ecommerce platform that can grow with your business, Shopify can do the job. It has the features you need and can be customized and extended with themes and apps. However, for smaller shops or if you’re just starting out, getting going with Shopify can be expensive. $29 a month plus the cost of a premium theme and any apps can get expensive for a newer business. Any overhead should be weighed against you’re expected revenue. Signing up with Shopify only takes a few minutes and the 14 day free trial means you can test it out first. Sign up is pretty quick too. You can be selling in a matter of hours on a platform that could last you years. Fast set up and fairly low cost. Dozens of good looking free themes and powerful premium themes. Easy to use admin screens so you can manage products, orders, and customers. PCI compliant with SSL for every store. Extended shop functionality requires apps or customization. Some of these apps have fees and paying for customization can be costly. This may still be better than other platforms. Shopify has built in blogging features but if you’re used to WordPress it can appear clunky. If you have a large blog, you may be better off running a separate blog with WordPress. Shopify offers fantastic value for it’s cost. However, every business is different and it’s best to thoroughly consider the various options and decide for yourself what would work best.